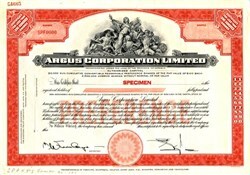 Beautifully engraved SPECIMEN certificate from Argus Corporation Limited. 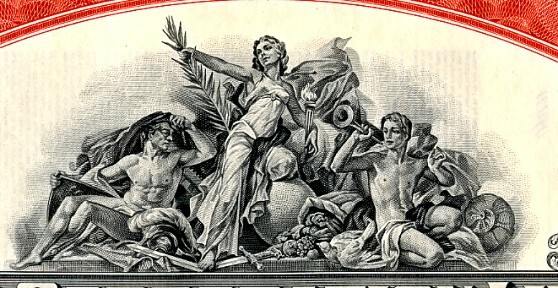 This historic document was printed by the British American Bank Note Company Limited and has an ornate border around it with a vignette of three allegorical figures. This item has the printed signatures of the Company's President and Secretary. Argus Corporation Limited's principal activity was to derive revenue from investment holdings, all of which are shares of Hollinger Inc. Hollinger Inc, together with its subsidiaries publishes newspapers in the United States, the United kingdom and Israel.